February can be one of the coldest and snowiest months in North Texas, but the long range outlook suggests February 2017 won't be that way. The current La Niña is fading and should be gone for the month. There is some uncertainty in the long range temperatures models, so there is no clear sign to whether or not temperatures will be above or below normal. The only parts of the country that may see below normal temperatures are the northern plains and the upper Mississippi Valley mainly due to the deep snow pack. January was a very wet month for most of North Texas. D/FW International Airport received 4.39 inches of rain, nearly 2.5 more than normal. 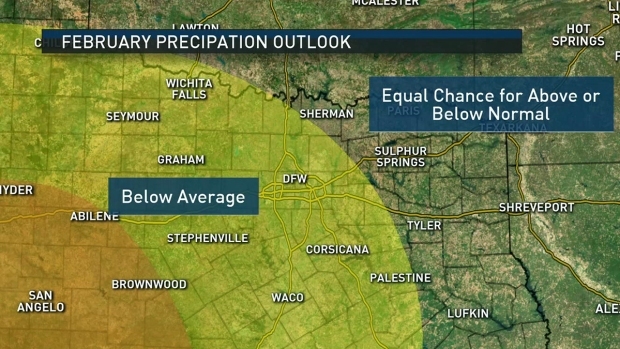 Far northeast counties in North Texas are sliding back into drought conditions, while the entire area is expected to see below normal precipitation in February. La Niña is fading and should be gone soon, leaving some uncertainty in the long range temperatures models for February. How about this for a long range forecast: Thursday, all eyes will be on Punxsutawney, Pa. for Groundhog Day. It will be mostly cloudy and if the ground hog does not see his shadow, spring is only six weeks away.